Breaux turned 21 last month and he grew up outside Houston in Tomball, Texas. He hit .485/.528/.818 as a senior at Tomball High School but wasn’t drafted in 2016. Breaux headed to McLennan Community College in Waco. As a freshman with the Highlanders, Breaux authored a .401/.473/.773 batting line with 18 doubles and 19 homers in 59 games, and he also struck out 22 with a 4.73 ERA in 13.1 relief innings. Baseball America (subs. req’d) ranked him as the 301st best prospect in the 2017 draft class. The Astros selected Breaux in the 36th round but couldn’t get him to sign. After the season Breaux headed to the Cape Cod League and more than held his own with wood bats against elite college pitching. He hit .271/.310/.474 with nine doubles and six homers in 35 games for the Falmouth Commodores. Despite that, Baseball America (subs. req’d) did not rank him among the top 50 Cape Cod League prospects that summer. Breaux returned to McLennan for his sophomore year and hit .404/.532/.831 with 14 doubles and 18 homers in 56 games this past spring. He didn’t see much action on the mound, throwing only four scoreless and hitless innings with eight strikeouts. MLB.com ranked Breaux as the 71st best prospect in the 2018 draft class. Baseball America (subs. req’d) ranked him 88th. The Yankees selected Breaux with their second round pick, the 61st overall selection, in this year’s draft. Special advisor Nick Swisher, the ultimate baseball bro, announced the Breaux pick during the MLB Network draft broadcast. Part of me thinks the Yankees did this intentionally. As a draft-eligible sophomore slated to transfer to Arkansas, Breaux had some leverage, and he turned it into an overslot $1.5M bonus. Slot money for the 61st pick was just under $1.1M. Breaux signed about a week after the draft, so this wasn’t a prolonged negotiation. 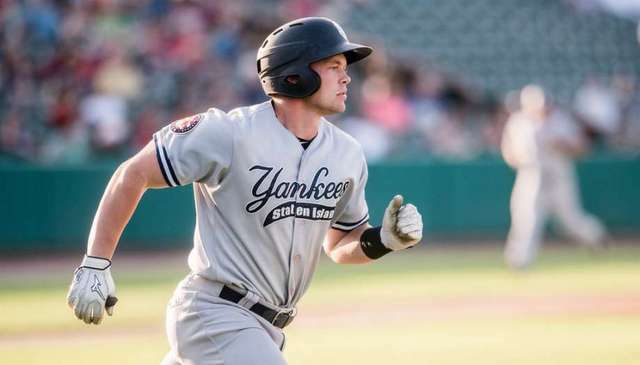 After a quick three-game tune-up in the rookie Gulf Coast League, the Yankees assigned Breaux to the short season Staten Island Yankees, where he hit .280/.295/.370 (94 wRC+) in 27 games around a minor hamstring injury. Breaux didn’t hit a home run in his pro debut, but he did bang nine doubles in those 27 games. The hamstring was a non-issue during Instructional League after the season. Built solidly at 6-foot-1 and 220 lbs., Breaux looks the part of a power-hitting catcher, and power is his calling card offensively. He projects to have well-above-average raw power from the right side and he sells out to get to it. Breaux takes a big maximum effort swing and, as a result, he’ll swing and miss quite a bit, as his 16.1% swing-and-miss rate with Staten Island shows. When he connects though, gosh, the ball tends to go a long way. Breaux is an aggressive hacker at the plate — he walked only three times in his 27 games with Staten Island (2.9%) — who was able to keep his strikeout rate (18.4%) down during his pro debut. The approach is a long-term concern though. Breaux has to develop more plate discipline and also remain more controlled at the plate. He doesn’t have to take a max effort swing to drive the ball. Once he learns to tone it down a notch, he’ll take a step forward as a hitter.
? While the power potential is exciting, Breaux’s single best tool is his throwing arm. He regularly sat in the upper-90s in one-inning stints in college and touched 100 mph on occasion. Breaux was a legitimate pro prospect as a pitcher but he prefers to catch and the Yankees will keep him behind the plate. If the plate discipline never comes around and catching doesn’t work out, getting up on the mound could be an option down the road. Breaux’s arm is obviously a weapon behind the plate, and he’s improved in the other aspects of being a catcher since his high school days. He’s a good receiver and he moves well blocking the ball. All those young power arms the Yankees have in the lower minors will give him a good workout behind the plate going forward. Breaux is a good athlete who runs well, enough that he could move to the outfield down the line, if necessary. I have to think Breaux is ticketed for Low-A Charleston next season, where he very well could end up sharing catching duties with first round pick Anthony Seigler a la Gary Sanchez and John Ryan Murphy back in the day. Breaux starting the season with Charleston and then moving up to High-A Tampa at midseason — allowing Seigler to catch full-time with the RiverDogs — would seem to be the ideal scenario. There’s always a chance the Yankees hold Breaux back in Extended Spring Training because catching is hard and they like to give those guys extra attention, but that would surprise me. I am intrigued but not in love. Catchers with power are forever cool with me, especially when they have a rocket arm, but Breaux has some very real plate discipline issues to address, and that’s never easy. Hopefully things click for Breaux and he learns how to better control the strike zone, because if he does, he could become a truly elite hitter at his position. If not, upper level pitchers will pick him apart. That said, quality catchers are hard to find, and Breaux has the tools to remain behind the plate, even if his plate discipline means he becomes a Miguel Olivo clone long-term.